I have a long history of labeling things. I label books I've read so I know which of my many books I've finished. I label movies I loan out so I'm sure to get them back. I even used to label my athletic socks that looked just like those my then-teen daughters had so I was sure to wear my own, not theirs (and vice versa). I believe my affection for labeling began 32+ years ago, when my husband and I — then just dating and coworkers — worked together one evening labeling this and that around our place of employment. During a break in our labeling shelves and storage spots, I used the label-making gun with the dial for letters to type out a secret message pig-Latin love note to my hubby. He still, all these decades later, has that black tape featuring white letters saying, "Iay ovelay ouyay." And I still have an obsession with labeling. The Epson LabelWorks printer is an app-enabled label printer that prints from smartphones, iPods and tablets via Bluetooth connection or PCs and Macs via an included USB cable. The printer can print labels ranging from 1/4-inch to 1-inch wide, in a variety of mediums including iron-on tape, peel-and-stick tape, metallic tapes, ribbons and more. Set-up was surprisingly simple. 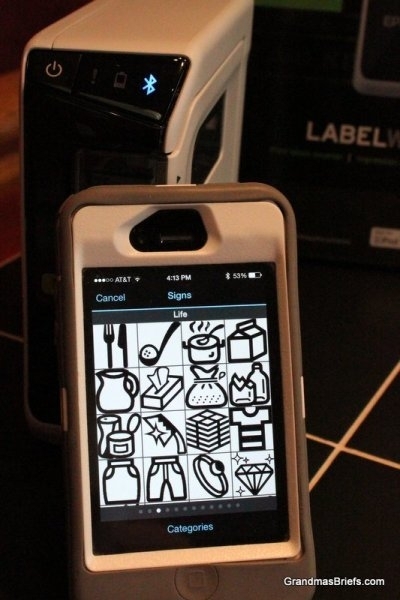 I downloaded the free Epson iLabel app to my phone, connected my phone and printer via Bluetooth, and I was ready to get labeling in mere minutes. To try out the printer, the first label I made was to label my Epson LabelWorks printer, using the included easy-peel tape. The second? A label for my husband, of course (no pig Latin this time; just a straightforward "I love you" with a graphic from the more than 400 in the app). Then I set to work creating iron-on labels for some back-to-school clothing I planned to mail my grandsons. Swapping out the easy-peel label cartridge with the iron-on cartridge was simple as could be. As I'd not ironed on a label in quite some years, I first printed a label with my grandsons' bloggy nicknames to practice ironing on to a cloth napkin. Because there were no directions on the iron-on tape, I believe I had the setting too high and ironed the tape a wee bit too crispy. But with that in mind, I added labels to the clothing for my favorite kiddos. With the heat setting on the iron a tad lower, the labels came out beautifully on the clothing (which I can't show here because I don't reveal my grandsons' real names — and wasn't willing to label their clothing with their bloggy nicknames). The labels were soft, so no uncomfortable labels would scratch the necklines of the boys. They were also impossible to remove. Per my daughter, the labels held up to washings, as well. All in all, the Epson LabelWorks 1.2-inch iron-on label tape was everything one could want in an iron-on label. Even more, though, considering the personalization that can be done with the Epson LabelWorks printer paired with iLabel app. Everything about the Epson LabelWorks printer, the LabelWorks tape, and the iLabel app worked like a dream — minus a few times the printer and the app lost connectivity (though that could be related to my internet connection more than anything). The printer is the smallest 1-inch tape printer on the market (compare it to my iPhone in the photos above) and is portable. With the ability to create personalized ribbons for holidays and birthdays, book labels, clothing labels and more, I see labels galore in my grandsons' future. No doubt more "I love you" labels in my husband's future, as well. The Epson LabelWorks printer LW-600P has a suggested price of $99 and comes with the printer, USB cable, AC adapter (for use when not powered by six AA batteries), and sample tape. The Epson LabelWorks Iron On tape runs $19.99, with many other tape designs, colors (including glow in the dark! ), and mediums available for various prices. The Epson LabelWorks LW600P printer and the full line of LabelWorks label tape can be purchased at Epson.com. Disclosure: I received this product free for review. Opinions and anecdotes are my own.